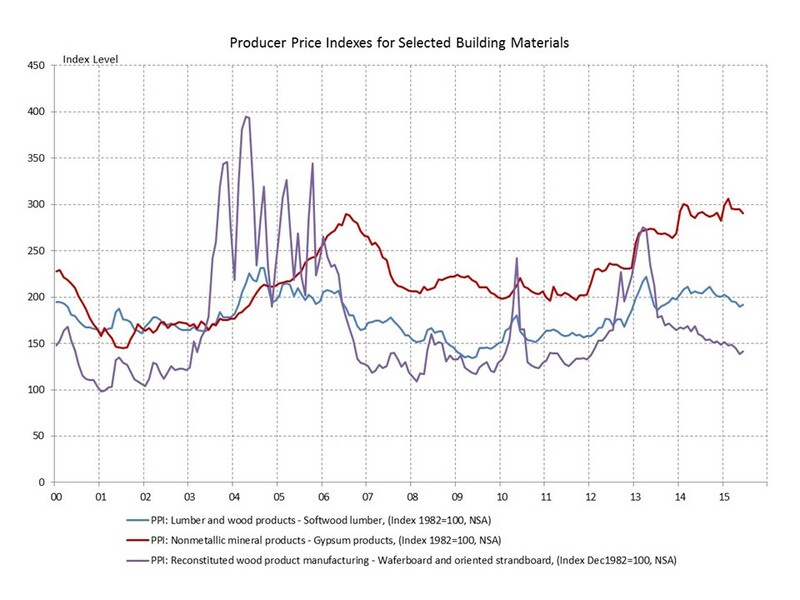 The Bureau of Labor Statistics (BLS) released the Producer Price Indexes (PPI) for June. Inflation in prices received by producers (prior to sales to consumers) rose 0.4% in June after a 0.5% increase in May. The increase was based on rising prices for both goods (0.7%) and services (0.3%). Within goods, a 4.3% increase in the price of gasoline followed a 17.0% jump in May. Prices in non-gasoline energy goods and food were mixed. Prices for goods less food and energy rose 0.4%. Wood products prices ticked up in June after trending down through the first half of the year. Softwood lumber prices rose 1.0% for the month but are down 9.1% from a recent high in September 2014. Prices for OSB rose 2.4% in June after a 20.4% slide that followed the collapse in prices that ended in July 2013. An unusually hot, dry summer has lumber traders concerned about an early end to harvesting because of fire season and its implications for availability and pricing, according to reports from Random Lengths, a wood products industry publication. Gypsum prices slipped 1.5% in June after being flat in May, increasing to 5.3% the retreat from a February peak.